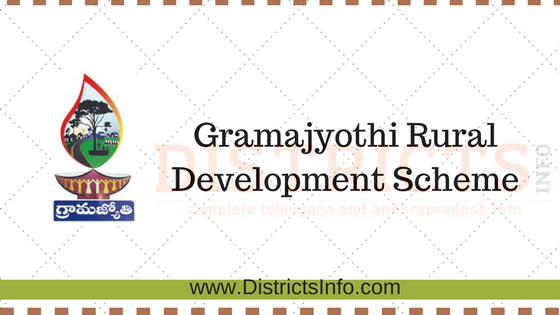 Gramajyothi Rural Development Scheme -Telangana State: Telangana government designed a new scheme Grama Jyothi for the development of villages and hordes. The scheme was designed on August 15th of 2015 and was launched on August 17. It was decided, Rs. 25,000 crore would be spent on this scheme. Each village under this scheme will be allotted two crores to five crore rupees. These funds will be utilized to solve the problems in villages and provide basic amenities. Chief Minister of Telangana Mr. K.Chandrasekhar Rao decided to implement Grama Jyothi scheme for rural development and this is done through timely release of sufficient funds. Funds allotment for the scheme is done based on the population of the village. The villages are required to chalk out a development strategy for their villages. Rs. 25000 crores would be spent in five years from the implantation of the scheme. The scheme is meant to provide basic amenities in rural areas such as roads, drinking water, drains, sanitation etc. Gram Panchayats will be given all the authorities to plan how the funds will be allotted. They will address the poverty, social security, education, agriculture, health nutrition and SC/ST welfare and other issues. Telangana government is confident that the Gramajyothi scheme will be very effective in influencing the quality of life in rural areas. Gramajyothi scheme is different from all the development and welfare programs launched by the State government till now. Under the Gramajyothi program, Gramasabha will decide on what development works should be taken up and these development works will be implemented. Gramajyothi scheme is an extension of Mana ooru Mana Pranalika scheme that was launched by KCR government. But then it was not clear how much funds will be available for the development of the village. Many government departments work at rural levels. All the officials in this department now will have to be responsible for the development and welfare programs and work extending cooperation to each other. A Large number of people in India lives in villages. Villagers know better what their village lack and Gramajyothi allows them to discuss and decide on what development works they have to do for the development of their village. Gramasabha plays a key role in implementing the Gramajyothi scheme. The decision of Gramasabha is important and works are taken up based on them. Sanitation, drinking water, health, nutritious food, education, natural resources management, agriculture and basic amenities are the seven important areas on which Gramajyothi program will concentrate. 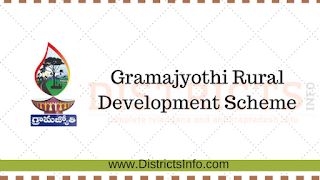 This Gramajyothi Rural Development Scheme is applicable following districts : Adilabad, Bhadradri Kothagudem, Hyderabad, Jagtial, Jangaon,Jayashankar Bhupalpally,Jogulamba Gadwal, Kamareddy, Karimnagar, Khammam, Kumuram Bheem, Mahabubabad,Mahbubnagar,Mancherial Medak, Medchal, Nagarkurnool, Nalgonda, Nirmal,Nizamabad,Peddapalli,Rajanna Sircilla,Rangareddy,Sangareddy,Siddipet,Suryapet Vikarabad,Wanaparthy,Warangal (Rural),Warangal (Urban),Yadadri Bhuvanagiri in the Telangana State.